Aluminum Welding Services | Complex Welding & Unique Materials - Meyer Tool & Mfg. Aluminum and the material has become a very popular choice for use in fabricating (UHV) Ultra High Vacuum chambers for various applications. Aluminum is particularly well suited for chamber designs in which magnetic shielding is a concern. We have even gone to the extent of measuring magnetic permeability before and after welding. This particular pressure vessel had to be welded to very strict AWS D17.1 Standards. 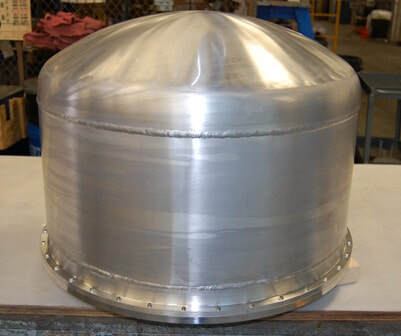 The vessel consisted of a spun formed head, a rolled shell, and a machined flange. Adapting to the different material thickness while maintaining porosity free welds that pass 100% x-ray made this project particularly challenging.